In a few short weeks spring will be beckoning us outdoors to tackle a new garden project. Many of us have sunny garden beds with an abundance of flowers—peonies, iris, phlox, Shasta daisies, purple cone flowers and rudbeckias to name just a few. But when it comes to those shady spaces, other than hostas people are less sure what to grow. For a delightful spring garden project I suggest transforming a difficult shady area into a beautiful woodland garden inspired by our own native forests. Our local forests have so much to teach us about plants that thrive in the shade of tall trees–when they bloom, how they grow and the soil that suits them best. Each spring, after months of winter dormancy, the deciduous forests of New England suddenly come alive. As the sun streaks through the still bare branches of the taller canopy trees it gradually warms the cold ground. 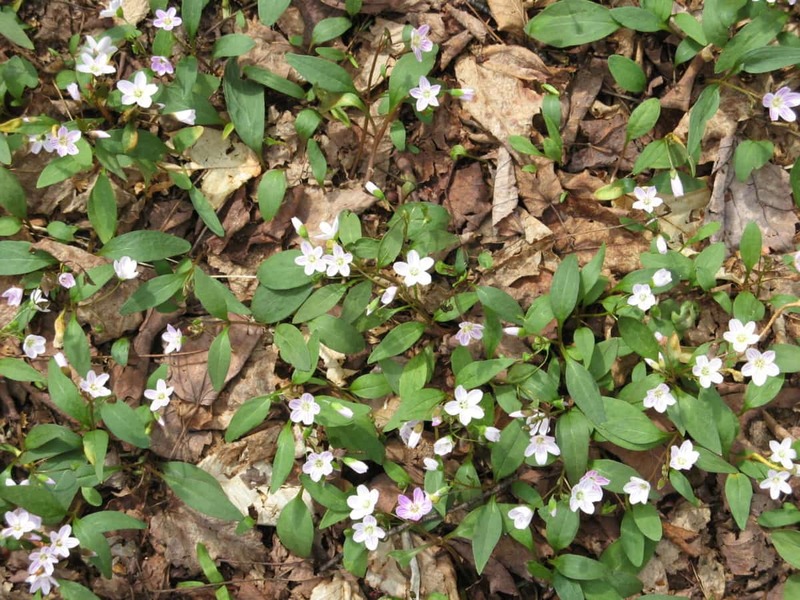 Spring beauties carpet the forest floor in late April and early May. But once flowering is completed they vanish below ground until next spring. 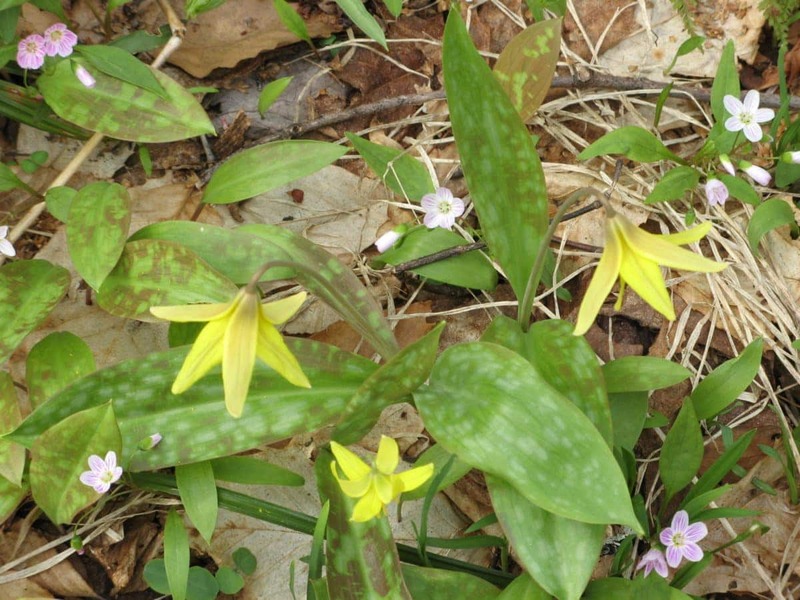 And then something truly magical happens: a host of spring wildflowers— bloodroot, dog-tooth violets, trillium, spring beauties, Dutchman’s breeches, foam-flower and many more—burst forth and light up the ground. After a few short weeks this amazing spectacle draws to a close. 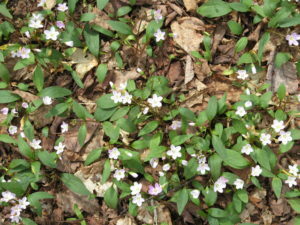 As trees leaf out the ground becomes shaded, and the spring wildflowers start setting seed. 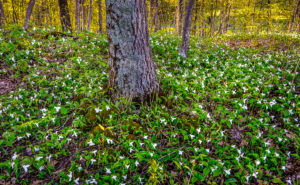 Many woodland wildflowers are ephemeral, meaning that, once they have set seed, the entire plant disappears below ground until the following spring. Some however–most notably bloodroot, Jack-in-the-pulpit, foam-flower, bellwort, wild ginger and trillium—continue to maintain their leaves for most of the summer for added photosynthesis. To grow woodland plants successfully in our own gardens we need to replicate the unique growing environment found in the woods. Start by looking for a spot that lets the sun come through to the ground in the springtime but will become shady during the summer months. The space beneath a group of smaller garden trees such as crab apples or serviceberries would be ideal for a small woodland garden. First gently remove any grass that will compete with your new plants, taking care not to damage the roots of the trees. However the soil around very large trees, especially mature honey locusts, maples or oaks, is far less desirable because their thick thirsty surface roots dry out the soil. Also avoid the area beneath dense evergreens, which will likely be both too dark as well as too dry. 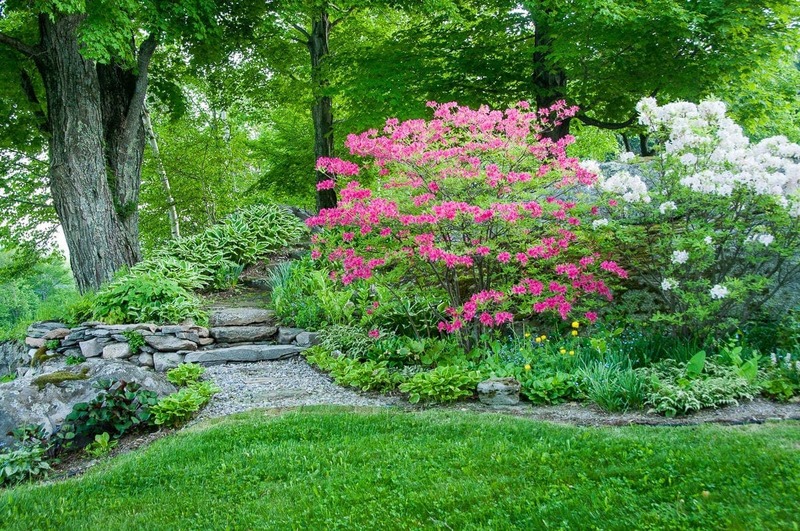 If you have deciduous woods on your property you have a great opportunity to create a larger woodland garden. Start by cutting out any low growing brush and then, for easy access, remove the lower branches from the taller trees. Finally add a meandering wood chip path so that you will be able to enjoy your flowers up close. Nobody rakes leaves in the forest! Every year in the forest a mix of leaves, twigs and bark drop to the ground where they gradually decompose and merge into the top layers of soil. The resulting ‘forest floor’ is a friable nutrient-rich structure that stays moist even in dry periods, creating the perfect growing environment for the understory plants. And, for a successful woodland garden, you want to ensure the soil is both moisture retentive and rich in organic matter, emulating the soil you find in the forest. Start at your compost pile! First extract some well-decomposed compost from the bottom of the pile, spread this all across your new bed in a layer about three inches deep and then very gently dig it into the top six inches of soil. Now gather some partially decayed leaves from last fall, either towards the top of your compost pile or possibly in the woods. Then chop them up by running the lawn mower through them a couple of times and spread the resulting material all across the top of the soil of your new garden. We are all familiar with hostas (or plantain lilies)—those workhorse plants for shade gardens. Hostas actually originated in northern Asia, but over the years hybridizers in this country have made innumerable crosses amongst the various species of plantain lily. The result today is a huge assortment of hostas in all sizes and colors for our gardens. But for a true woodland garden—one that is inspired by our own local forests—nothing can compare with the beauty of our native wildflowers. Although most bloom in the spring, several also have wonderful leaves that, along with different ferns, create a ‘textured green carpet’ throughout the summer. And in late summer it is time for the wood asters (the blue Symphyotrichum cordifolius and the white S.divaricatus) to bloom. Both make a lovely end-of-season splash just when the fall foliage is starting. Like across much of New England, the forests around here have acidic soil. And likewise in my garden. Hence most of the flowers I see in the local woods are also perfectly at home in my garden. 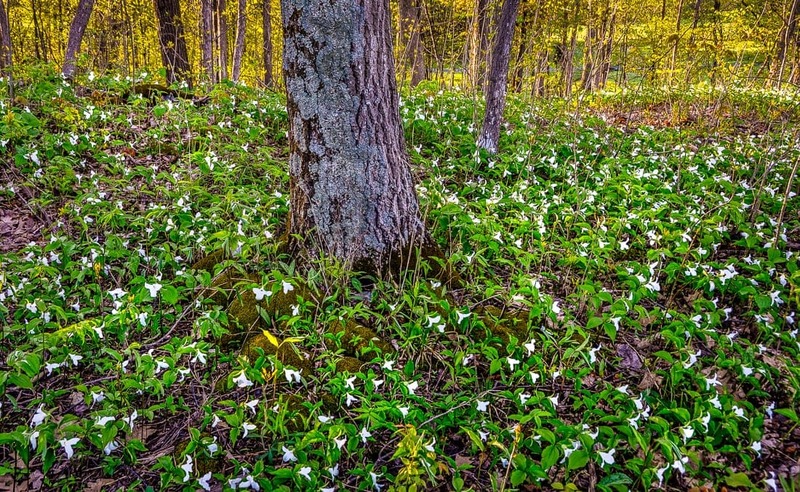 However in some parts of New England, such as along limestone bluffs, the soil is quite alkaline and supports a very different mix of wildflowers. In selecting plants for your garden be sure to take your cue from your local forest. Here are some of my favorite native woodlanders that thrive in acidic soil and that are well matched to my garden. Almost all are available from the Vermont company, American Meadows. 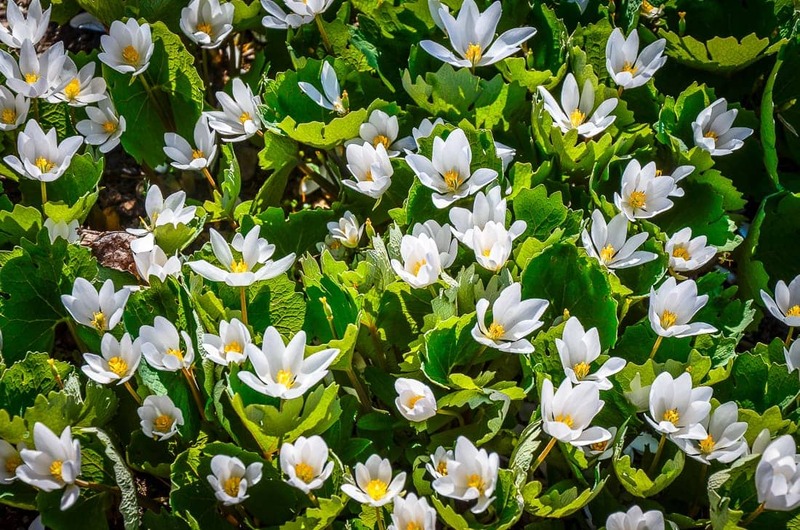 The beautiful bloodroot (Sanguinaria canadensis) is the very first to appear each spring. Each flower consists of 8-10 sparkling white pointed petals radiating out from the clear yellow center. On sunny days the pristine white flowers open wide to receive the early pollinating insects. But each night and on rainy days they close up tightly to protect their precious pollen. 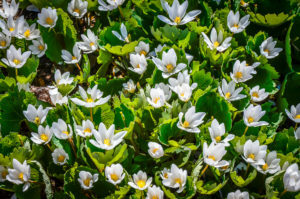 The underground portion of a bloodroot plant is actually a fleshy subterranean stem called a rhizome. Over time this grows outwards horizontally to form a substantial colony, resulting in a dense carpet of lovely flowers in springtime, followed by lots of wide scalloped leaves for an attractive groundcover during the summer months. 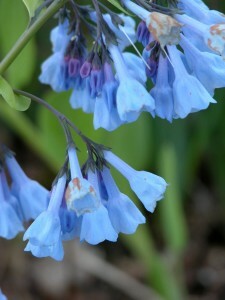 Our lovely native Virginia bluebells, after setting seed, will disappear underground. Before long the Virginia Bluebells (Mertensia virginica) emerge. Their flowers, like a cluster of nodding bells, are the clearest sky-blue you can imagine. After they have finished flowering, be sure to let their fat round seed pods mature and the seeds fall where they may. In a few years you will be rewarded with dozens of new plants to greet the spring. Squirrel Corn (Dicentra canadensis) and its close relative Dutchman’s Breeches (Dicentra cucullaria) have delicate fern-like leaves and creamy-white flowers hanging from the stem like little bells. Foam-flower (Tiarella cordifolia) with its feathery white flower plumes and variegated scalloped leaves. Given space, it will gradually spread outwards to form an attractive clump. The whimsical Jack-in-the-Pulpit (Arisaema triphyllum), with its unique central spike (or spadix) inside a circular petal and curved green hood, is reminiscent of a voluble preacher in his elaborate pulpit. Canada Anemones (Anemone canadensis) have charming white flowers which thrive in a moist spot. However they are best planted by themselves as they can be a little too aggressive among smaller plants. 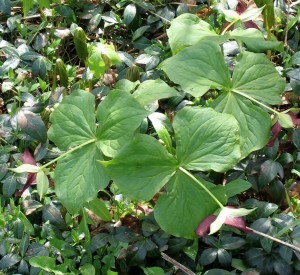 The various species of Trillium are much-loved flowers for the spring garden. Both Painted Trillium (Trillium undulatum) and Wake Robin (Trillium erectum) need an acidic soil. But if you who live where the soil is alkaline, you could grow an unforgettable expanse of White Trillium (Trillium grandilflorum) that will cause passers-by to stop and exclaim. Towards the end of May I find the wild spring flowering azaleas (Rhododendron prinophyllum) growing in the woods near here. The swamp azalea (Rhododendron viscosum), is found in wetter areas and blooms later in the season. 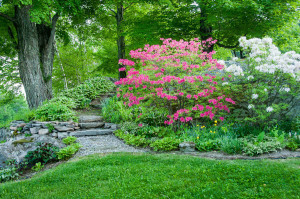 If space permits–and providing your soil is reliably acidic– incorporating some rhododendrons or azaleas will add beauty, structure and fragrance to your woodland garden.For many years I have grown several kinds of azaleas (which lose their leaves in winter). But this year I will be adding some evergreen rhododendrons in a few sheltered spots. My azalea season starts in late May when several cultivars in the ‘Lights Series’ start to flower. This group of azaleas are renowned for their winter hardiness. These are followed by in mid-June by the azalea Weston’s Innocence with its pure-white flowers, and in late June by Jane Abbott which has pale-pink flowers, and finally ‘Lemon Drop’ in late July. And finally, be sure to round out your new garden with plants that remain above ground all summer, including native ferns with lacy foliage like the Maidenhair fern (Adiantum pedatum) and the Lady fern (Athryium felix-femina) and, for a nice textural contrast, wild ginger (Asarum canadensis).